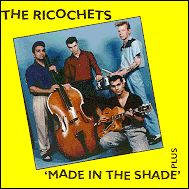 The Ricochets were one of the first wave of Psychobilly bands, springing forth from the Rockabilly scene. Their drummer and bassist both played in the Guana Batz later on, and the drummer also played with The Meteors and The Highliners. Classic early Psychobilly, lots of tracks. The first two tracks are classics of their type. Track 7 is the Billy Idol/Generation X anthem and track 15 is a cover of a Slade song. The Ricochets started out as the backing band for Marney Webb (look out for his 'Still searchin' - a great track), and were originally known as 'Pink And Black'. They were a pretty average covers band in the beginning, but a girl that hung around with them had some cool ideas. I went to one of their rehearsals with a view to doing something with them, but heard nothing special. As I was walking out of the door, they obviously thought I was out of earshot, so they started messing about with some of their 'new' ideas. I stopped in my tracks, listened, and went straight back!